One popular accessory for many it would seem is a re-radiating antenna. Re-radiating antennas aren't that expensive. They start at around �30, and although they don't look much, they do the job well. All re-radiating antennas need to be powered. Until recently, most have had to be powered by the cigarette/accessory socket which has been a problem for many. Now PC-Mobile have recently designed and brought out a battery operated re-radiating antenna. The need for re-radiating antennas is because many car manufacturers are creating UV coated windscreens. 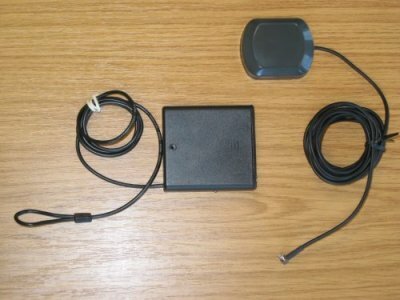 These and other devices fed through the windscreen like heater coils, metal flakes can all cause a signal drop in GPS signals, and a re-radiating antenna will help boost these signal levels back up to what they should be enabling you to have your GPS Receiver inside the car in the dry, and still receive adequate signals to be able to use street routing software. The PC-Mobile re-radiating antenna comes in two parts. First the active antenna that you see on the right that sports a magnetic base so you can fix the square antenna block to the roof of the car, followed by a 3 meter long cable which should give you enough cable to run it inside the door and conceal the cable quite adequately on most cars and the cable terminates in an MCX or BNC connector depending on the one you need, the one we reviewed terminates in an MCX connector which is standard for most antenna sockets. You then have the second part (on the left) which is the battery box which houses 3 x AA size batteries, a power switch and a blue led that lights up when switched on. This has a 1 meter long cable that ends in a hardened loop cable. This is the internal antenna and needs to be fixed to the GPS Receiver you currently have. Now most people may have concerns that the only using 3 batteries may be an issue, and that they need to be replaced on a very regular basis. PC-Mobile says that under normal use, Rechargeable Ni-Mh batteries should last for around 100 hours, and using alkaline batteries you should expect to see 200 hours use. This means if you're looking at commuting 2 hours a day, and switch the unit off after every trip, you should expect to see the batteries last up to 100 days using alkaline batteries! Most of the accessory socket re-radiating antennas require to be within 45cm of the GPS Receiver, due to the design and power, the PC-Mobile re-radiating antenna prefers to be as close to the receiver as possible. In the prototype version we received, it came with an elastic band, although this might sound primitive, it works well and allows you to secure the loop to the GPS receiver. If you have a Navman sleeve, then you could place the loop over the antenna that sticks out of the sleeve. 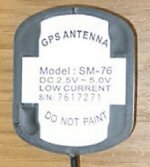 The active antenna is like the one supplied with many re-radiating antennas, and very similar if not identical to several add-on active antennas that can be purchased for many GPS receivers, including handheld receivers like Garmin's. The antenna itself is a SM-76 and currently sports a low current of between 2.5v DC and 5.0v DC. The base of this antenna is magnetic, and quite a strong one at that. Many readers have a concern whether or not these active antennas will fall off the car at high speed, and I can definitely say there's no chance of that. Once you place this on the body work of the car, it's difficult to get it off! It clings beautifully to the bodywork. I think I have a coated windscreen, do I need a Re-Radiating antenna ? This is a question we are receiving a lot of. People with 4 or 5 sat signals on average knowing there are a maximum of 12 satellites they can pick up think they may be having problems. The easiest way to test this is, acquire a fix in-car like you normally would do, then move the GPS receiver out of the car onto the roof. Now see if your GPS signal increases by 2-5 satellites. If it does, then you may be better off having a re-radiating antenna in-car. Are re-radiating antenna's any good for in-car use ? Now compare the above screenshots with the ones below. These below were taken using the PC-Mobile re-radiating antenna. You'll see that the signal has quadrupled and we can now receive a 4 satellite lock! Quite impressive! PC-Mobile are selling this as a complete unit at the price of $52.50 for the MCX (GARATX) connector version (�32.54) or $52 for the BNC (GARATB) connector version (�32.23). 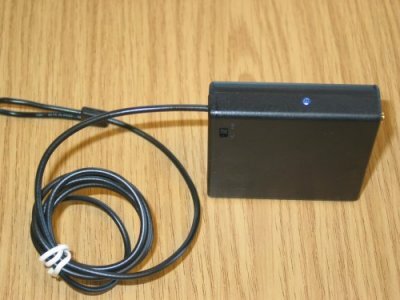 If you already have an active antenna that terminates in the MCX or BNC connector, then you can just purchase the battery box (seen below) at the price of $25 MCX (�15.50) or $24.90 BNC (�15.44). If the 3 meter cable is also not long enough, PC-Mobile also sell 3 meter extension cables for both connector types on the GPS Antenna Page. Please note, even if you are receiving a 4-5 satellite 3D lock, you may not experience any greater signals. First test by moving your GPS receiver out of the car to see if your signal increases. If it doesn't, then purchasing a re-radiating antenna will probably not do much for your signal. How did we achieve these ratings ? Have any comments about this review ? Post them here.